arts and culture with the Tamaki family over dinner, and experience farm life at the Agrodome Sheep Show. Your visual journey continues with a trip over the Southern Alps on the TranzAlpine Train where you will visit a jade factory and marvel at artists at work, see the awe-inspiring Franz Josef Glacier and discover the spectacular Milford Sound on a lunch cruise. Next, let your hair down & get adventurous in Queenstown before continuing to discover Melbourne’s colourful hidden laneways. Experience an immersive Aboriginal Cultural Experience in Cairns and paint a souvenir Boomerang. Then it is off to snorkel and cruise on the Great Barrier Reef and cuddle a koala at Cairns Wildlife Dome. The adventure continues with a sail on Sydney Harbour and a toast to the sunset on a dinner cruise. Venture inside on a guided tour of the iconic Sydney Opera House. A morning cruise on Waitemata Harbour is followed by a sightseeing tour including Bastion Point, the War Memorial and Viaduct Harbour. Later spend some free time exploring on your own or relaxing at your hotel. Travel into the Waikato region to visit the incredible Waitomo Glow Worm Grotto for a boat tour with a local guide and a walk through the limestone caves. Continue to Rotorua where you’ll visit Te Puia Thermal Reserve and be accompanied by a local guide to view New Zealand’s biggest geyser, bubbling mud pools and thermal springs. ‘You’re invited’ to the Tamaki Family Marae for an exclusive cultural evening. Experience a Haka challenge and a spine-tingling Karanga welcome and after a live show, join your hosts in a private dining room to feast on a traditional Hangi meal. Then why not take part in the Poi Dance or Haka for the men! Explore Rainbow Springs Nature Park with a local guide. You may even spot a kiwi! Next stop is the Agrodome Sheep Show for a taste of farm life. Later you’ll fly to Christchurch. Board the TranzAlpine train for your journey over the Southern Alps to Arthur’s Pass. At Hokitika you’ll visit a New Zealand greenstone (jade) factory to see the artists at work. Travel along the coastal road to Franz Josef Glacier for a short walk to view the glacier and perhaps take an optional scenic flight (weather permitting). Journey over the Devil’s Staircase along the shore of Lake Wakatipu to Te Anau. You’ll drive through the Homer Tunnel before reaching Milford Sound. Enjoy lunch and a cruise with Mitre Peak and Bowen Falls high above you. Later, return to Queenstown for the evening. Today choose one from a range of Included Choice sightseeing experiences. Ride the Shotover Jet, join a wine tour, play a round of golf or take a gondola to the Skyline Restaurant for dinner. Perhaps take a 4WD minibus through Skippers Canyon, relax with a spa treatment at Millbrook Resort or explore Queenstown on a Segway. Taylor to enjoy lunch in their 600 acre garden. 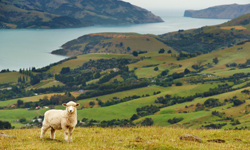 Travel over the colourful Canterbury Plains to Christchurch. Spend today as you wish. You may consider an Optional Experience to the Penguin Parade on Phillip Island or perhaps a trip along the spectacular Great Ocean Road. his morning encounter unique Australian animals at the Cairns Wildlife Dome. Later, board a high speed catamaran and cruise out to the Great Barrier Reef. See coral and tropical fish from the underwater observatory and semi-submersible craft. There is the opportunity to go snorkelling and view this natural living wonder up close (equipment provided). Enjoy a buffet lunch before returning to Cairns. Prepare yourself this morning for the spectacular views on the cliff-top coastal walk from Tamarama Beach. The walk features stunning vistas, beaches, parks, cliffs, bays and rock pools. Your destination is famous Bondi Beach for an iconic Australian experience. You’ll be greeted by a local surf lifesaver before lunch at an Aussie institution, the Returned Servicemen’s Club, with its views over the sparkling Pacific Ocean. Your host will take you on an exclusive tour through Australia’s oldest surf lifesaving club where you’ll learn about the history of Bondi and surf lifesaving. Later, return to the city to visit the Royal Botanic Gardens and see panoramic harbour views from Mrs. Macquarie’s Chair. Top off this highlight day on a tour of the iconic Sydney Opera House with a local guide. Explore the beautiful harbour city of Sydney further. Make the most of your day and take an Optional Experience to the Blue Mountains. Gather together this evening to celebrate your vacation at a farewell dinner with your Tour Director and new-found friends at Darling Harbour. Your vacation concludes this morning after breakfast. You'll be transferred to Sydney Airport for your onward flight. Itinerary, departure dates and prices may change. Prices vary by season and are “from”, land only. Contact us with your specific travel date.